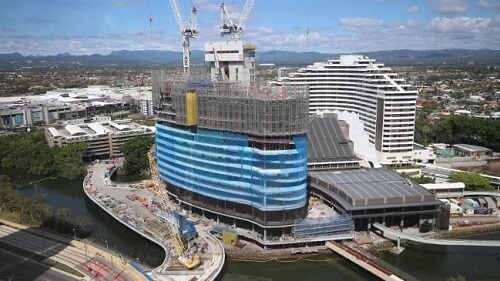 The Darling Hotel Tower which is a Star Gold Coast integrated resort is scheduled to open its doors on the 22nd of March. This according to The Star Entertainment Group Limited, the owners of the project. This 17-story hotel tower will hold 57 suites which will range in size from 70 square meters to 328 square meters. All suites will house luxurious decor, furniture and finishes, allowing guests to feel like royalty throughout their stay. The Darling was designed by casino architect, Steelman Partners who are based in Las Vegas. The renowned architect designed the hotel tower to suit the needs of both business and leisure travellers. In saying so, the suites boast cutting-edge technology; this includes smart televisions, Bose sound systems. If that wasn’t enough, the technology available to guests allows them to customise their lighting and temperature settings. More so, players can ready themselves for the rooftop restaurant and bar known as ‘Nineteen at the Star’. This restaurant will feature alongside a stunning infinity swimming pool. When it comes to casinos and gaming, the Darling offers the entire first floor to their Independent private gaming rooms. Players can expect the around 200 casino game machines alongside a multitude of your favourite table games namely; roulette, baccarat and blackjack. The Star Entertainment Group Limited’s Managing Director from Queensland, Geoff Hogg says that The Darling will assist in positioning the Star Gold Coast. Hogg says they are looking to get the Star Gold Coast on the premium side of the market. Additionally, he states that they want to ensure that the surrounding area has a ‘compelling value proposition’. Reason being is, that they are competing not only on a domestic but a global scale, as they are looking to attract both local and international guests. Hogg makes mention that The Darling has been designed in such a way that it has its own unique arrival experience. The Darling has a pronounced eclectic atmosphere and boutique design. More so, their distinct spirit and location just adds to the luxuriousness of the hotel and casino.